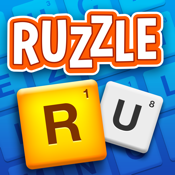 Praise for Ruzzle, one of the best word games ever! Challenge your friends to endless rounds of fun with Ruzzle! It is like electronic Scrabble, where you challenge yourself, friends, or random opponents to see who can find the most words. Upside down, right side up, crooked, or criss-crossed, any where you can find them. Ruzzle has three rounds per game, and whoever has the most total points at the end wins. And the best part is, you can chat with your friends while playing the game! Ruzzle is one of the most addicting games ever! When you start playing, you will never want to stop!